Avast Antivirus protects your PC by detecting and blocking malicious behavior. 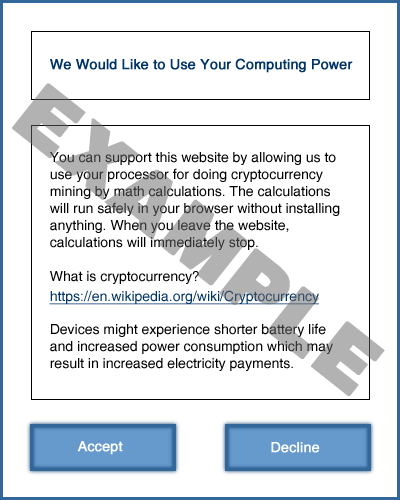 To determine whether a website or software using cryptomining technology is malicious, we use a set of guidelines for acceptable behavior. By default, all cryptomining software is marked as a Tool, even when the rules below are followed. Any cryptomining software that does not follow these guidelines will be detected as malware. Before installation and before running the software for the first time, the software shows all relevant information and a warning with Accept and Decline buttons that follow the rules below. The software has an Enable/Disable or Start/Stop button to turn mining on and off. The software will not automatically start mining after installation. The user needs to start the mining themselves e.g. by clicking a button. In the case of changes to the mining terms, a new text box with Accept and Decline buttons is shown. The mining application must provide a visible activity indication (active/inactive) with the ability to control this state (i.e. start/stop buttons). All information is fully visible, readable, and understandable. Style is consistent for all information (reasonable size, logical position, color contrasting to background). Accept and Decline buttons are presented in a similar style allowing the user to make a choice easily and not requiring the user to exercise any unnecessary effort to choose the decline option. Websites show a text box with all relevant information. Websites do not mine before the site visitor grants it the right to mine by clicking on an Accept button. The Accept button from text box works as a direct mining referral. In case of changes in mining terms, a new text box with Accept and Decline buttons is shown. All information is fully visible, readable and understandable. Accept and Decline buttons are presented in the same style and color. If you have questions regarding these guidelines, please contact Avast Support.